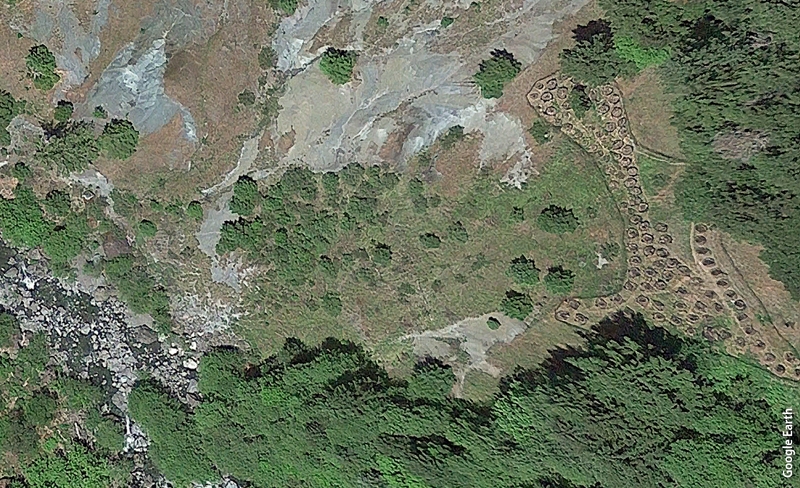 This series of satellite images shows the development of a greenhouse complex in a Humboldt County forest. Planting cannabis for commercial production in remote locations is creating forest fragmentation, stream modification, soil erosion and landslides. Without land-use policies to limit its environmental footprint, the impacts of cannabis farming could get worse, according to a new study published in the November issue of Frontiers in Ecology and the Environment. Earlier studies have shown that cannabis production causes environmental damage, including rodenticide poisoning of forest mammals and dewatering of streams due to improper irrigation. Cannabis grows near a salmon stream Humboldt. Diverting water to irrigate cannabis can dewater streams during the summer and impact wildlife. Cannabis, as either a medicinal or recreational drug, is now legal in more than 30 U.S. states and in several countries. In California, where medicinal marijuana has been legal since 1996, voters in November approved the sale and possession of one ounce of marijuana for recreational use. As a result, cannabis production is ramping up. Effective policymaking for a new crop can be challenging without scientific data. In this study, Butsic and Ian J. Wang, assistant professor in the Department of Environmental Science, Policy and Management at UC Berkeley, and Jacob C. Brenner, associate professor in the Department of Environmental Studies and Sciences at Ithaca College in New York, present an approach for early assessment of landscape changes resulting from new agricultural activities. Their approach uses per-unit-area analysis of landscape change. To study forest fragmentation in northern California, the scientists compared the effects of cannabis cultivation to those of timber harvest from 2000 to 2013 in Humboldt County. Based on the size, shape and placement of the cannabis grows among 62 randomly selected watersheds, they quantified the impacts relative to those of timber harvest. Satellite image A shows a clearing with greenhouses (upper left in clearing) and rows of cannabis plants (lower right in clearing), surrounded by a buffer area. Image B shows a typical pattern of large areas of clear‐cuts for timber harvest and various stages of regrowth. “We found that although timber has greater landscape impacts overall, cannabis causes far greater changes in key metrics on a per-unit-area basis,” Butsic said. On a per-unit-area basis, the cannabis grows resulted in 1.5 times more forest loss and 2.5 times greater fragmentation of the landscape, breaking up large, contiguous forest into smaller patches and reducing wildlife habitat. “The results show how important it is to consider environmental impacts at different scales,” Brenner said. Current California law caps the size of outdoor cannabis production to 1 acre per parcel, to prohibit the development of industrial-scale cannabis operations outdoors. An unintended consequence of this law may be small dispersed cannabis grows that edge out wildlife. While the long-term effects of cannabis cultivation on the environment are unknown, the researchers concluded that land management and agricultural policy informed by further research may reduce these threats in California and in other states and countries where cannabis production can be regulated. Local city and county governments are banning them or not treating the same as other agricultural products pushing farmers into remote areas that remain permissive.